In our June edition of our Preemie Family newsletter we learned about Andrew Michael Blake Meuller, who was born at 23 weeks, weighed in at 1 lb. 6.5 oz. and spent 126 days in the NICU. Read more in an update by his Mother, Karen . . .
Our son Andrew had a rough go of it in the womb from the beginning. At a little over 6 weeks gestation, he was subjected to Cytotec, an abortion drug, because of what was believed to be a missed miscarriage. Somehow he survived both that terrible misdiagnosis and treatment, and placenta previa as well, and the many bleeding episodes that would occur throughout the remainder of the pregnancy. The prognosis was that he would be miscarried in the coming weeks. Andrew proved the doctor wrong, making it to what some hospitals at the time believed was the very edge of viability, 23 weeks and 0 days, while many others would have said he was a week too young for them to do anything. Even today some hospitals still have a 24-week minimum to intervene. Thankfully he was born at a hospital that believed in 23-weekers, and even younger babies. 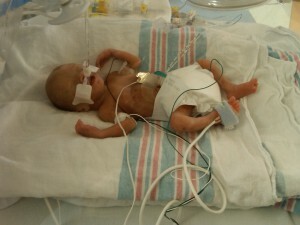 He was born by emergency C-section, in April 2009, at 1 lb. 6.5 oz and 11 inches. He spent 126 days in the NICU, 18 weeks exactly. During his stay Andrew experienced many of the common micropreemie issues but was thankfully spared some of the more severe ones, such as NEC or sepsis or a severe brain bleed. He had a large PDA (open duct in the heart that normally closes at birth) that wouldn’t close with either of the commonly used medicines to treat it, so he had to have a ligation, a surgical procedure to close it, when he was 12 days old. He experienced long-term hypotension, which was treated with hydrocortisone. He had a bilateral Grade 1 IVH (mild brain bleed) which resolved in the NICU. Andrew also had a bout with e coli that was successfully treated. He had a large inguinal hernia that they waited to operate on until he was 9 months corrected. He also had Stages 1-2, Zone 2, ROP, which is where the blood vessels in the eye are beginning to form abnormally. It has to be monitored closely or the retinas can detach and blindness can result. Thankfully his ROP resolved in the months after coming home. Although born at the 75th percentile in weight, he would fall to the 5th percentile by 27 weeks, where he would remain for the next couple of months. 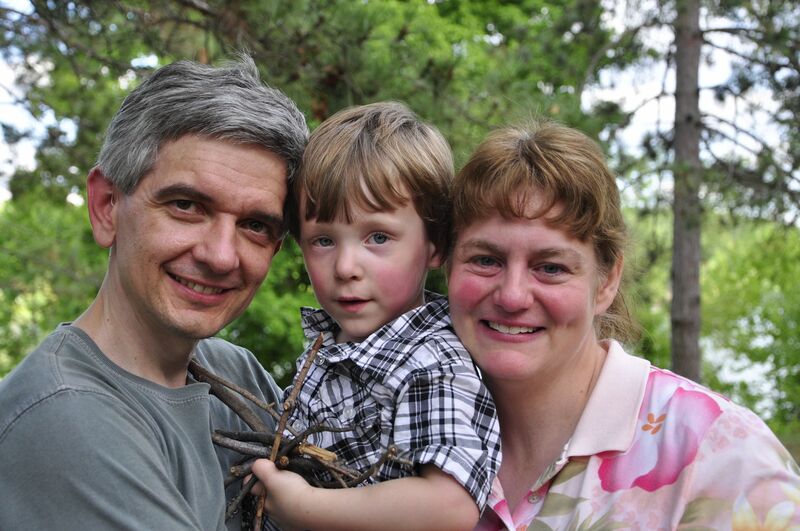 Andrew needed 12 blood transfusions during his stay, and he had to be bagged numerous times. 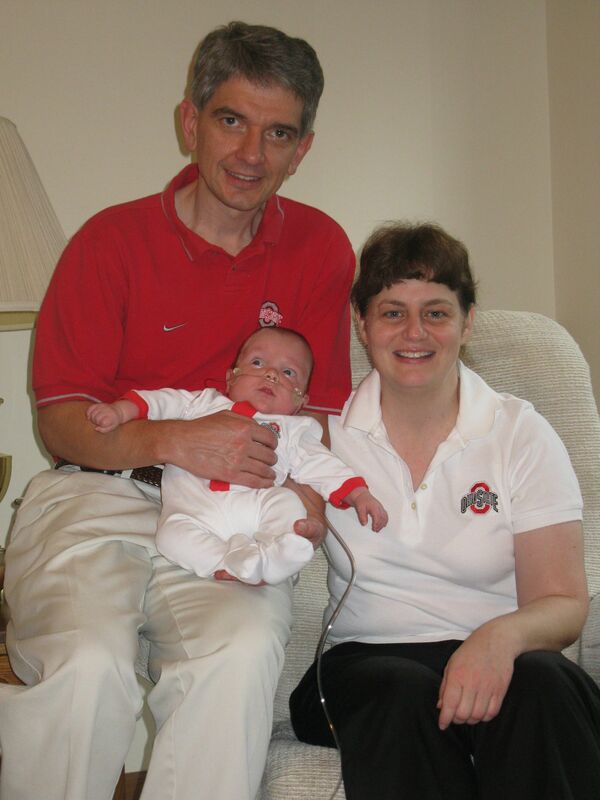 His lungs were his biggest issue–he was vented for 11 weeks and on CPAP for a little over 3 weeks. He spent his last 4 weeks in the NICU on a low-flow cannula at only .2 liters, but then needed .5 when he came home, based on a detailed sat study they ran on him before discharge. He was on oxygen here for a little over 4 months. He was on meds (lasix and potassium chloride) his first 3 weeks home, but those were his last lung meds. past his 4th birthday (twice a day until a year before that). Today he drinks just fine, any method. Another reason for the delayed drinking was because his oral motor skills were behind for a while, especially around age 2 to 3. In addition, when he was an infant we learned he had a very mild case of tracheomalacia, which is a floppy airway (mild because it really didn’t appear to have any symptoms, other than possibly affecting his stamina, one of many things that did that, including his Size 4 tonsils. We had them and his adenoids removed at 2 corrected. His tracheomalacia, his ENT said, likely resolved soon after that time). The vocal cord damage will probably be long-lasting, his one medical issue (at this time) that will be here for life. There’s a slight chance he may outgrow it, up to about 13, but it isn’t likely. His voice is softer and raspier than most, as a result, but not too bad. While he had fairly severe BPD (chronic lung disease) in the NICU, based on how long he needed at least CPAP (past 37 weeks in his case), Andrew’s lungs appeared to be on the fast track to recovery even before he came home. He had no real symptoms of his BPD once home, except that he breathed heavier than typical babies, for some time. We kept him super healthy–he didn’t have a cough until he was 3. This allowed his lungs to grow and heal well. He had some bouts of bronchitis his first year of preschool that responded well to meds (usually amoxycillin), but this second year he has had only typical, mild colds–nothing in his lower lungs. Knock on wood. I think his lungs have finally grown up/caught up; he’s been very healthy. Andrew also outgrew his hearing loss, somehow, some way. 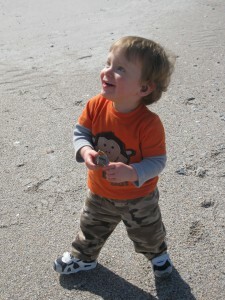 We had questions about it even when he was an infant, but especially when he was a toddler, as he began letting us know he could hear some new environmental sounds and my soft voice, without his hearing aids. I did a lot of tests with him at 2 and could tell he could at that point hear and understand my whispers with his back turned, from a good distance. It took a while, but my suspicions were finally confirmed when he was 3 via a second opinion. The impossible happened, somehow. A 23-weeker mystery, I think, involving something in him that just finally matured. However, he had an ear infection (his first) in his right ear at the time his normal hearing was detected, which would be the start of mostly minimal conductive loss troubles in that ear that would last nearly two years. Finally, as of last month, Andrew’s second ear tube has proven successful and his eardrum is now back to normal. His hearing has finally tested normal in that right ear as well. He’s come a long way from a 50 to 65 dB overall loss to what is now in the 5 to 15 dB range. As far as development, from the beginning Andrew was in the normal range for his adjusted age (or above, later on), in gross and fine motor skills, receptive language, and cognition. The one developmental area he had a true delay in was speech; his expressive language development was something of a rollercoaster ride. Andrew had speech delays of various kinds throughout his first 3 years. He had no cooing phase, making short, quick little sounds instead, and he was late to start repeated babbling–“babababa” stuff–until 10 months adjusted. 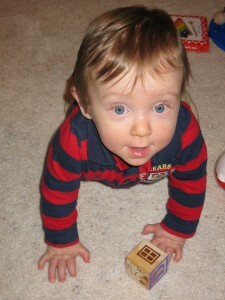 Then he took off in words and he shot forward, gaining 8 months in speech development in just 2 months. From 3 months behind to 3 months ahead; it was crazy. That was from 10 to 12 months adjusted. He continued to be ahead some in his speech–his vocabulary was and has always been wonderful–but phrases just couldn’t take hold. We waited 15 months between the first one he ever said and when they finally, truly emerged. So he had a moderate language delay by that time (2.5 or so). And then things just skyrocketed, once again. We went from barely having any 2-word phrases to hearing a few 8-word sentences in just 3 months, between 2.75 and 3 actual. He would test at the mean for actual age, a 100, verbally, at age 3 corrected. He was almost at the mean, a 98, 5 months before that, in overall expressive language, after falling to the 60s and 70s (estimated) just 2 to 3 months before that. But the language delay wasn’t his most serious speech delay. That was in articulation, and it was quite severe. His speech therapist estimated he was only in the 40s, a 50 at best, in that area, at about 2.75 actual. Two months later, he tested a 65 there, as he began to take off fast. That score secured a place in a special preschool for him, for the next 3 years. We are so glad he squeaked in because the school has been wonderful for him. Just a month after testing, a speech therapist at a Voice Clinic thought he was already to the gray, or borderline, area in articulation. And a few months later, he was likely normal, albeit lower normal range. It was crazy how well that, too, came on so fast in him. I figure it had something to do with brain development; something was just delayed there for a while, and then it kicked in. Today he appears to have a rather advanced vocabulary along with average language and articulation skills. Other than speech, Andrew has had no real delays, on paper, in any skill tested area (though he has some non-qualifying delays in a couple). Even with only being delayed in speech, Andrew still had Early Intervention representatives from every area monitor him through infancy, at least checking in every couple of months (for PT it was monthly normally) until he was walking. We have a wonderful county for Early Intervention here, which we are so grateful for. And his EI speech therapist was so great with him that when she retired when he was a year old, we hired her on privately. Andrew’s non-qualifying delays include a mild fine motor delay in academic areas, such as writing and drawing. I would guess he was maybe a year behind there, at 4 corrected, but now is probably only 6 months behind, at most. This wasn’t all fine motor areas, though, which is why we were told even a year ago, when he seemed at his worst, that he wouldn’t have qualified for OT services. In some areas of fine motor, like block stacking and zipper handling, he was at the mean, maybe even a little ahead. But not in anything to do with writing. His class had to trace their names last year. His improvement during that 9-month period was that by the end of the year, he wasn’t scribbling as large as at the beginning. But by this past fall, he was tracing well, and he began copying some letters this past winter. He can now copy, in a recognizable way, many letters of the alphabet, but still has others he can’t do yet–pretty age appropriate when adjusting his age. It’s coming. Though his grasp isn’t mature; he often uses a fist, still, which is why it continues to be an area to watch, and he’s also somewhat ambidextrous. He should be able to write his name, too, even by his corrected age, but he can’t yet. However, he is really coming on there now and is very close. His drawing skills have also come a long way since last summer, when he couldn’t make a recognizable picture. He was a little slow with buttoning too, but has started to do that some. He can dress himself, something a year ago he was not doing in some ways. Andrew’s other area of mild delay is in play with his peers. I think this is a combination of him being isolated for 3 years from children, especially groups, and in being an only child. He started out preschool scared of the other kids, a little. He was one to sit back and observe for a long time. Then when he began to play there, it was alone and just occasionally parallel. This year, there’s been a lot of parallel play, and there’s starting to be some interactive play at school, but it isn’t the norm yet. However, he talks to the other children a lot. At home, he’s doing much better with interactive play with children, in one-on-one play dates, or small group situations with peers. But it’s something about the large class…he is still not one to just jump in. He was physically late to show signs of potty training readiness as well, with bladder training especially. But that came on strong last spring. He was done with accidents, pretty much, by 4 corrected, so not too bad. But at 3 corrected he was going as often as a newborn still and in no way was physically ready for training. It was another area where extreme prematurity had an effect on timing. Andrew’s activities have expanded so much over the past year. Last school year, it was just preschool. This year he is involved in dance, a combination class (ballet, tap, tumbling, creative movement and preschool songs). He has also played soccer and basketball this year and is currently in t-ball. 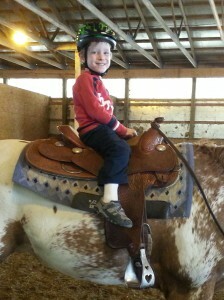 And he began horseback riding lessons in April. He has come a long way in dance…from trailing the class to pretty average. We are very proud of his effort. In sports, he was definitely at the bottom of his teams, until recently. On his last soccer team, he began engaging more, running after the ball and kicking it multiple times, for the first time, really. And now he’s doing a great job on his t-ball team. All of these activities have been good to help with his weaker trunk (almost all babies born so early have a weaker core from not getting all the time tucked in the womb that most babies have). The trunk affects so many things, including fine motor skills. I think one reason for the jump in fine motor recently for Andrew is because we’ve been hitting the trunk stuff hard. The weaker core even affected some of his gross motor skills by age 4. Andrew could pedal a trike a little bit by 3 corrected, at the mean, but he couldn’t pedal one well until a year later, so he was late there. But last fall he began riding a bike with training wheels, and he isn’t bad at it. As an infant or toddler, you wouldn’t have predicted he’d be behind in some motor skills areas, as he hit all his milestones at the mean, even ahead of it some, for adjusted age. As a toddler, he really shot ahead for a while. He scored a 120 for adjusted age in fine motor at 18 months corrected and I believe a 127 in gross motor, when looking at his adjusted age, at 2 corrected, following a spurt. But preschool skills take a lot more core strength than toddler ones. We discovered at 3 that his core wasn’t up to that of his peers, far from it. He had just deceived us for a long time by making things look easy. Andrew Today is 44″ Tall!!! doing very well with pre-academics, Andrew will be in prekindergarten next year–we are going by his adjusted age for when to start him to school, so we’re thinking of him as an August birthday. I think the extra year will help him catch up in those lagging areas of fine motor and social skills, to be more on par with the class average, when he begins. He’d be ahead either way in reading, so that isn’t a concern for me that he might be bored there. Plus, the school he will go to provides enrichment for those who are ahead. I like to share Andrew’s story because when he was in the NICU, we could find very few stories on the Internet about older 23-weekers…I think I only found one. We met a labor and delivery nurse on vacation a year ago who couldn’t believe Andrew was a 23-weeker. She said he didn’t even look like a preemie. When I told her he was actually born at 23+0, she was floored, saying that her hospital only saved babies born at 23+5 and up. She was going to go back and tell her team about him. He was early ultrasound dated, and he had 5 total in the first trimester, many of them with just a 4-day margin of error, so we know he couldn’t have been 23+5. It really hits home to know how lucky we are he was born at a hospital that helped 23-weekers, Ohio State, and at a week old was transferred to one with an excellent program for micropreemies, Nationwide Children’s Hospital. Using the micropreemie outcome calculator on the NIH web site, and correcting for the slight amount of steroids he would have had in his system from getting a dose just a few hours before delivery, it appears he had around a 26 percent chance of survival and just an 8 percent chance of survival without moderate or worse neurodevelopmental issues. He was one of the fortunate ones, for which we are truly thankful, and he continues to amaze so many with how far he’s come. My son was born at 22 weeks and 6 days of gestation, and spent 124 days in the NICU / ISCU, and became that hospital’s most premature graduate. It’s great to see a story of someone else who has been through something like this.